The Murder of Crows is an atmospheric alternative band from Duluth, MN. The duo consists of guitarist / vocalist Alan Sparhawk (Low, Retribution Gospel Choir) and violinist/vocalist Gaelynn Lea (Snöbarn, The Getarounds). 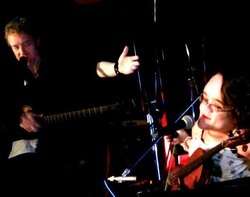 The Murder of Crows was formed when Sparhawk and Lea did a live soundtrack to a Lon Chaney film in October 2011. Although at first it seemed an unlikely pairing – with Alan’s long history in the indie/rock world and Gaelynn’s folk/bluegrass background – their divergent musical styles created a complementary sound which was really quite lovely. What’s more, it turns out they enjoyed playing together, so the Murder was born. At its core, The Murder of Crows is built around slow, winding, hypnotic instrumentals that hopefully create a kind of mental journey. Sparhawk utilizes looping pedals and other musical gadgets to produce layered waves of sound. Their music has been described as meditative, haunting, intense, and beautifully sorrowful. The band prefers to think of it as ideal bird-watching music. On June 1st, 2012, The Murder of Crows released its first-ever recording, a 7-track EP called "Imperfecta". It consists of two of Gaelynn Lea's original songs and five instrumentals. They recorded it by the big picture window in Lea’s living room (where they always rehearse), inspired by the menagerie of neighborhood birds outside. The EP name, Imperfecta, has two meanings. It alludes to Lea's disability, Osteogenesis Imperfecta (which means Brittle Bones). Although Gaelynn's music is not intended to be "about" disability, it has still shaped her life in undeniable ways. Imperfecta also acknowledges the fact that, indeed, no one is perfect. Really we're all just trying to make something beautiful out of our lives, despite our flaws and our often less-than-ideal circumstances. Musically, sets by The Murder of Crows have evolved into a unique blend of instrumentals and vocal songs. They have added in a number of Gaelynn Lea’s originals, some choice covers (from bands like Neutral Milk Hotel, Peter Tosh, Nirvana, and of course, Low), and a wider, more dynamic range of instrumental pieces. They have a distinct sound that cannot be pegged as solely atmospheric, or folk, or blues, or experimental. Their banter between songs is of note: reticent, deadpan stoicism meets chatty, bubbly enthusiasm. It’s an odd combination that provides a breath between their sobering and often emotional pieces. Maybe it’s the contrast that’s refreshing. Or perhaps it’s because the duo’s endearing friendship shines through their idiosyncratic dialogue. Nevertheless, somehow it works.